John Dewey is known as a pragmatic philosopher and progressive architect of American educational reform, but some of his most important contributions came in his thinking about art. Dewey argued that there is strong social value to be found in art, and it is artists who often most challenge our preconceived notions. Dewey for Artists shows us how Dewey advocated for an “art of democracy.” Identifying the audience as co-creator of a work of art by virtue of their experience, he made space for public participation. Moreover, he believed that societies only become—and remain—truly democratic if its citizens embrace democracy itself as a creative act, and in this he advocated for the social participation of artists. 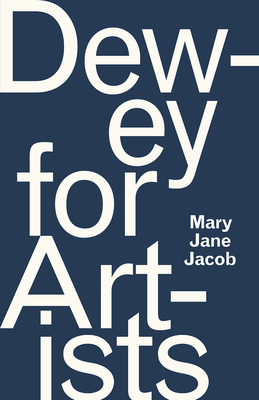 Throughout the book, Mary Jane Jacob draws on the experiences of contemporary artists who have modeled Dewey’s principles within their practices. We see how their work springs from deeply held values. We see, too, how carefully considered curatorial practice can address the manifold ways in which aesthetic experience happens and, thus, enable viewers to find greater meaning and purpose. And it is this potential of art for self and social realization, Jacob helps us understand, that further ensures Dewey’s legacy—and the culture we live in. Mary Jane Jacob is professor and director of the Institute for Curatorial Research and Practice at the School of the Art Institute of Chicago. "Dewey's progressive politics and their relationship to art, more specifically how they illustrate social practice art as an aesthetic experience, are the focus of Chicago-based curator Mary Jane Jacob's new book, Dewey for Artists. Written in an easy-to-digest manner, the book establishes Jacob among a small group of artists and art professionals—notably Tom Finkelpearl and Greg Sholette—who have long looked to Dewey as a theoretical foothold. . . . Jacob interprets Dewey's ideas through a myriad of experiential and participatory artworks by international artists with whom she has interacted or whose work she has curated including Tania Bruguera's activist workshop space for immigrants in Queens, the poetic installations of wafting fabric by Ann Hamilton, Thomas Hirschhorn's Bronx housing estate construction dedicated to Gramsci, a film by Jeon Joonho of his father remembering a particularly beautiful sunset, and the Norwegian forest planted to print books for Katie Paterson's Future Library project.. . . . [Dewey's] belief in living life as an artful practice and focus on fostering rational debate and creativity as a means to achieve a more just society remains a worthy lesson for artists and citizens alike." "The social activities of John Dewey and the contemporary artists discussed by Jacob show us that art can influence society actively. As the author explains, these art actions might be radical, but they also have value as human responses; what is important is to not ignore what is going on around us. . . .This book speaks not just to art. It is about something more essential: how a human being can live life well."